You might guess from the disc’s title (“Loneliness”), not to mention from the cover art, that isn't going to be the most cheerful of recitals; but in fact it isn't the least bit morose. 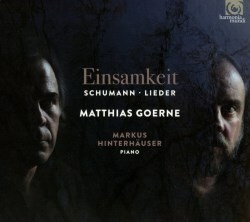 Matthias Goerne has used his time with Harmonia Mundi to show that he is one of the most distinguished baritones singing Schubert today (review), and here he gives us his first Schumann recital, which proves to be every bit as distinguished; perhaps even more so, because since recording the Schubert series Goerne’s voice has darkened into an instrument that is even better suited for exploring the world of Schumann’s melancholy. However, the title is misleading, because these songs are by no means all about loneliness. Many, in fact, are about finding peace in nature or, in fact, about the fulfillment of love. The predominant atmosphere of the disc is not, therefore, melancholy or sadness: it is inwardness, intimacy and insight. In fact, the German word Innigkeit could have been coined for it. Goerne is such a meditative, introverted singer that lieder suits him down to the ground (and, I'm sure, is why he is so much more widely recorded in song than in opera). In Meine Rose, the opening song, his voice never gets above pianissimo to express the poet’s most inward thoughts of love. It's a beautifully intimate experience, and the closeness of the recording means that he can carry off the permanent pianissimo very successfully. In this, Markus Hinterhäuser conspires with him to create the most careful, gentle, supportive of accompaniments so that, throughout the Lenau cycle, the feeling is one of the most intimate conversationalism, like opening a window into the poet’s (and the composer's) soul. Only in the third song’s address to the Herdsgirl is there a hint of extroversion, but even that is subsumed into a feeling of gentle melancholy as she becomes a metaphor for the transience of every earthly pleasure. The tone of the cycle is predominantly gloomy but, perhaps ironically, Schumann finds some hope in the final song, Requiem, with its thought about rest for the righteous. Their take on Eichendorff’s Hermit (Der Einsiedler) is restrained and remarkably stripped back, but manages, paradoxically, to sound at the same time majestic. The three opus 25 songs from the cycle Myrthen sound miraculously inspired, Goerne singing them with what feels like profoundly personal insights. Under Hinterhäuser’s fingers the harmonies of Mein schöner Stern! sound remarkably advanced, almost expressionist, and Goethe’s Nachtlied is distinguished by a remarkable stillness (Goerne’s breath control and restraint are remarkable here, too). The opus 89 cycle sets poems by Wilfred von der Neun which are often slightly awkward in their juxtaposition of nature and emotion, but they draw lovely things from the composer, and I liked the optimistic mysticism of Herbstlied and Ins freie, which has the most extrovert accompaniment on the disc. The Abendlied is a gorgeous way to finish, pianist and vocalist working in the closest harmony to produce a deeply felt response to Schumann’s realisation of what is, ultimately, a mostly optimistic response to nature. If you were trying to make a criticism then you might, perhaps, argue that the tone of inwardness is, perhaps, rather uniform, and that you might have wanted more varied drama for, say, the storm of Es stürmet am Abendhimmel. That would be trying to pick a fault, however. Goerne has, doubtless, curated this recital precisely so that it could show that side of his voice, and the closeness of his cooperation with Hinterhäuser makes it, for me, a remarkably successful and, yes, intimate experience. It’s just a shame about the misleading title! Goerne’s Schubert series eventually ran to nine volumes. Dare we hope that there might be more Schumann to come from this source?